Watch out though, this dust has claws. How dust particles on the Moon’s surface levitate and transport themselves across vast distances have baffled scientists for more than 50 years now — and has been used to explain the Moon’s ‘horizon glow.’ But, it seems that a team of scientists from NASA solved the mystery. “This new ‘patched charge model’ resolved a fundamental mechanism of dust charging and transport, which has been puzzling scientists for decades,” explained researcher Xu Wang, from NASA’s Ames Research Centre in California. The journal Geophysical Research Letters published the study. The team wanted to figure out if these dust particles are suspended by an electrostatic force. 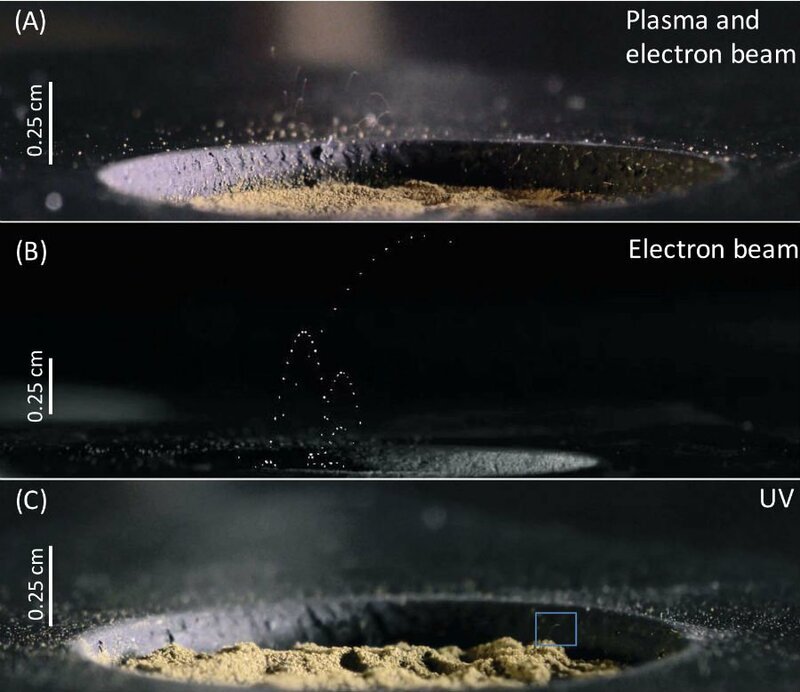 Wang, together with Mihaly Horanyi at the University of Colorado in Boulder, and their team of researchers conducted lab experiments to see how micron-sized dust particles would behave when exposed to ultraviolet (UV) radiation or electrically-charged gasses (or plasmas). The team discovered, in both cases, the dust would actually leap by a few centimeters above the surface. On the Moon, the strange properties of its dust combined with UV radiation or plasma from the Sun can loft single particles and, sometimes, even large dust clusters up above the surface. On the Moon, these dust particles would scatter light reflected from the Sun, creating that famous ‘horizon glow’ that was first captured in the 1960s by the Apollo astronauts and NASA’s Surveyor probes. “[T]hese dust particles would have been lofted more than ten centimeters (four inches) above the lunar surface, leading researchers to conclude that the moon’s “horizon glow” — seen in images taken by Surveyor 5, 6, and 7 five decades ago — may have been caused in part by sunlight scattering in a cloud of electrostatically lofted dust particles,” according to NASA. The same phenomenon was observed later over Saturn’s rings and in the craters of the asteroid Eros — where dust is also transported across vast regions devoid of winds or flowing water. “We expect dust particles to mobilize and transport electrostatically over the entire lunar surface, as well as the surface of any other airless planetary body,” said Wang. Unfortunately, the dust particles on the Moon actually create a rather harsh environment on its surface. The particles can be sharp and therefore dangerous to anything on the surface. These dusts are partly formed by meteorite impacts that pounded the Moon’s surface rocks into fine particles, which are actually sharp due to being covered by a glassy shell. The glassy shell comes from lunar dirt that’s melted into vapor, thanks to the energy from the meteorite impacts, which cooled and condensed on the dust particles. “The dust was so abrasive that it actually wore through three layers of Kevlar-like material on [Harrison Schmitt’s] boot,” explained Larry Taylor, director at the Planetary Geosciences Institute at the University of Tennessee, speaking of the Apollo 17 crewmember’s 1972 moon walk.